SUNY New Paltz welcomed a delegation of representatives from Chongqing University of Education (CQUE) and Ameson Education and Cultural Exchange Foundation for a campus visit on Oct. 16. The group, led by CQUE Vice President Yanbin Yang, met with New Paltz students, faculty and staff to continue a dialogue about the Chinese Dual Diploma Program, a partnership between New Paltz and Chongqing University of Education through which Chinese students split time between the two institutions, earn a four-year degree and attain skills as bilingual teachers. 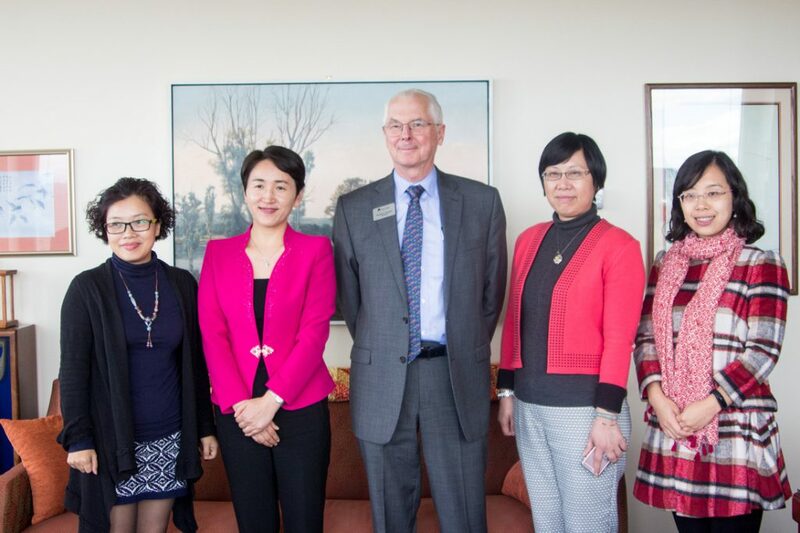 “It is a great honor for SUNY New Paltz to welcome this distinguished delegation of representatives from Chongqing University of Education,” said Bruce Sillner, dean of the Center for International Programs at New Paltz. The delegates’ day-long visit to New Paltz included a campus tour and meetings with President Donald P. Christian, Provost Lorin Basden Arnold and a group of CQUE scholars currently attending SUNY New Paltz. The Chinese Dual Diploma Program is a new addition to the College’s international offerings, developed by educators and administrators in the Center for International Programs and the School of Education. One phase of the program’s development was the feature of an Aug. 24 New York Times article, titled “Using Times Education Articles With Aspiring Teachers in China,” which documented work done by Associate Professor Lindsey Russo and Haggerty English Language Program Lecturer Sarah Elia with students in Chongqing. More information about the Center for International Programs at SUNY New Paltz is available online.